Hoje é o World Baking Day, por isso tenho uma desculpa para fazer um dos bolos que mais gosto, Fraisier. Já aqui tinha colocado uma receita de Fraisier de Lima. Desta vez fica a versão com hibiscus e ginjinha de óbidos. É o bolo desta estação. 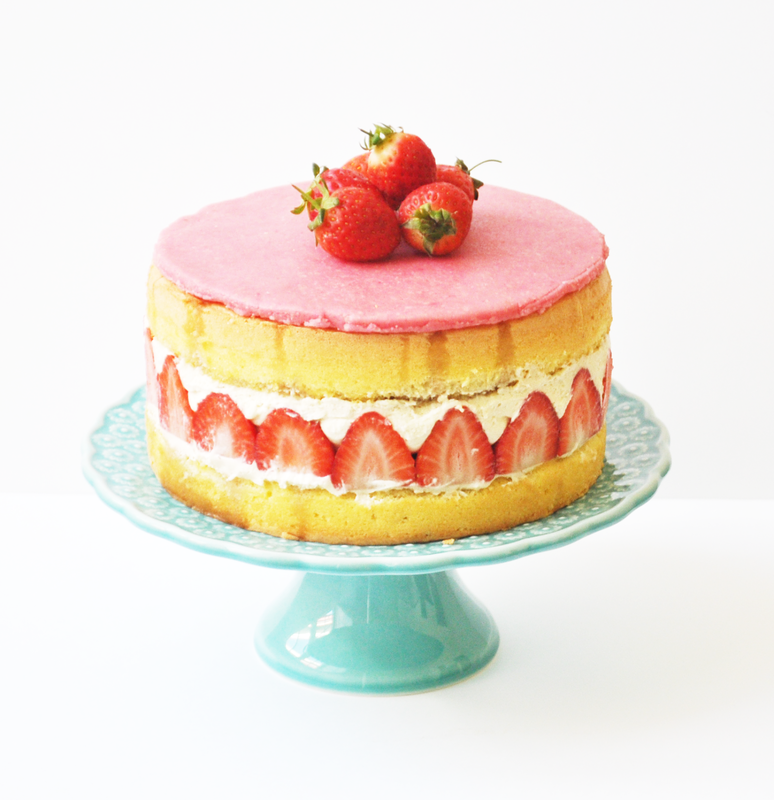 Today is World Baking Day, so I have an excuse to make an old time favourite, Fraisier. I had a recipe here of Lime Fraisier. This time is the version with hibiscus. It is this season cake. Para a mousseline, ferver o leite com os hibiscus e sementes de baunilha. Deixar de infusão por alguns minutos. Misturar as gemas com o açúcar e amido de milho. Remover os hibiscus, voltar a ferver o leite e verter sobre as gemas e mexer. Levar ao lume, mexendo sempre até engrossar. Cobrir com película, rente à superfície e refrigerar. Depois de completamente arrefecido, envolver as natas. Para a génoise, bater os ovos com o açúcar até ficarem esbranquiçados e duplicarem de volume. Envolver a farinha e, por fim, a manteiga derretida. Dividir por duas formas de 22cm de diâmetro e levar a forno pré-aquecido a 180º durante cerca de 20 minutos. Ferver todos os ingredientes do xarope e regar sobre a génoise. Colocar uma das partes do bolo num aro metálico com 22cm de diâmetro. Colocar um pouco de creme. Cortar morangos em metades e colocar nas extremidades e muito juntos entre si. Dispor os restantes morangos inteiros no interior e cobrir com o restante creme. Finalizar com a segunda génoise. Refrigerar por algumas horas antes de retirar o aro metálico. Cobrir com pasta de amêndoa ou polvilhar com açúcar em pó. Decorar com morangos. For the mousseline , boil the milk with the vanilla seeds and hibiscus . Infuse for a few minutes . Mix the egg yolks with the sugar and cornstarch . Remove hibiscus , return to boil and pour over the egg yolks and stir . Bring to medium heat , stirring constantly until thickened . Cover with cling film , close to the surface and refrigerate . After completely cooled , fold the whipped cream . For the génoise , beat the eggs with the sugar until they are whitish and doubling volume. Fold in the flour and finally the melted butter . Divide by two pans of 22cm diameter and take to a preheated oven at 180º for about 20 minutes. Boil all the ingredients of the syrup and pour over the génoise . Place one of the cake in a metal ring with 22cm diameter . Spread some cream. Cut strawberries in half and place them around the edge , close to each other . Fill the interior with the remaining strawberries and cover with cream. Finish with the second génoise . Refrigerate for a few hours before removing the metal ring . Cover with almond paste or sprinkle with powdered sugar . Garnish with strawberries. Uau! Está lindo, tenho mesmo de experimentar!